REMEMBER THE DAYS when having the video rolled into class was the most exciting thing that happened in primary school? An elementary school teacher has caused uproar in the United States by providing non-alcoholic beer to minors during class time. 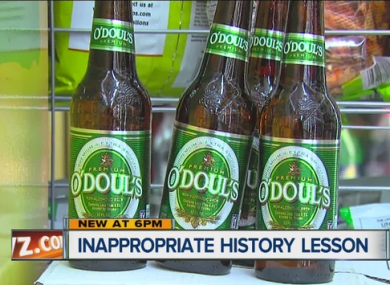 Superintendent Ed Koledo told The Flint Journal that a class of fifth grade students at Hyatt Elementary School had been given the opportunity to sample non-alcoholic beer O’Doul’s as part of a history lesson. The children – aged between 10 and 11 years old – were studying the food and drink consumed during colonial times, when ale was commonly favoured due to a lack of clean water. ABC12.com says the beer – which contains less than 0.5% alcohol -was actually purchased by a parent and brought to class with cornbread by a student. One of the students asked if they could bring in a non-alcoholic beer. I said they could as long as there was no alcohol involved. The project was authentic to the time period and very controlled in the classroom, so the students had a small taste of the O’Douls beverage. Students did not have to drink it if they chose not to. Koledo said the teacher had made an “honest mistake” and told The Flint Journal that there had been very little backlash within the school community. Nobody complained to the teacher, principal or me. We monitored the situation the next day. It was a dead topic so we just left it at that. However, DiAnne Hukill, president of Hyatt Elementary Parents Active in Linden Schools said the group had not been informed about the incident and expressed her surprise at the idea of a parent being allowed to bring the beer in. Liquor Control Commission spokeswoman Andrea Miller said the teacher could have been charged with a misdemeanor under Michigan state law. Koledo did not reveal whether she was facing disciplinary action but confirmed that the student involved would not be disciplined. Email “Teacher causes uproar by giving non-alcoholic beer to primary school class”. Feedback on “Teacher causes uproar by giving non-alcoholic beer to primary school class”.